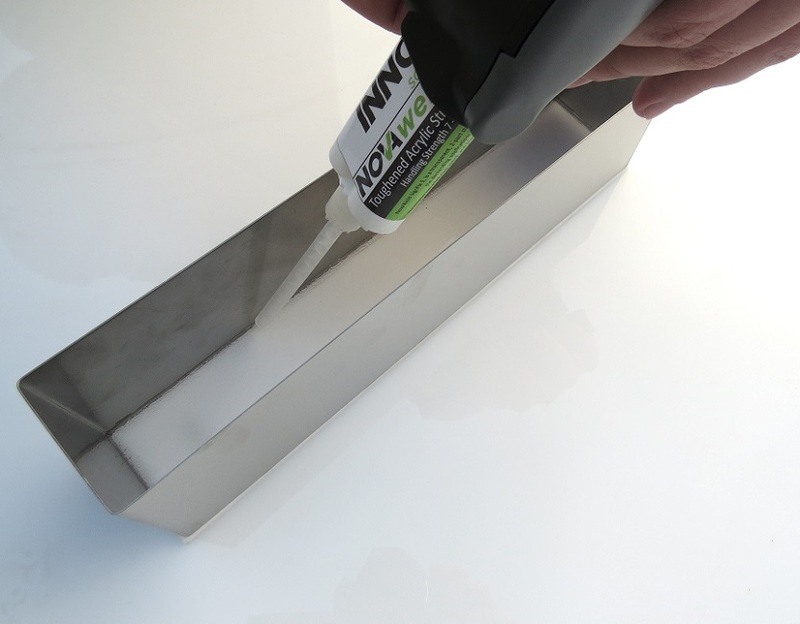 Industry leading adhesive experts, Innova Solutions have launched a revolutionary new, clear 2 part adhesive that combines flexibility with unrivalled bond performance and clarity. NovaWeld SignFix 5 has been developed in conjunction with SignFab, the largest letter manufacturing operation in the UK signage industry, the product has delivered benefits in terms of reduced production times, final product performance and aesthetics. Designed primarily for the manufacture of acrylic faced rimless and rim and groove letters, NovaWeld SignFix 5 bonds securely to both the stainless or aluminium return and acrylic face. After the 4 – 5 minute fixture time, the letter is securely bonded with the flexibility required to allow for the differential expansion that occurs between the acrylic and metal return when the letter is installed. Historically, adhesives have not been able to combine flexibility with both clarity and speed of cure. This has led to various methods and products being used for this application which has resulted in costly failures when letters have been subjected to external conditions. Whilst not the most effective of joint designs, NovaWeld SignFix 5 compensates for this by exhibiting tremendous bond strength to both substrates, coupled with flexibility to bond dissimilar materials, whilst aesthetically the clear cured product gives no shadow line when the letter is illuminated. The product has gone through a rigorous testing procedure both in lab conditions and external weather cycles for a period of 12 months, where it was subjected to extremes of temperature, humidity and moisture. NovaWeld SignFix 5 is currently being used by the industry’s leading letter manufacturers and is available in both 50ml and 400ml cartridge sizes.